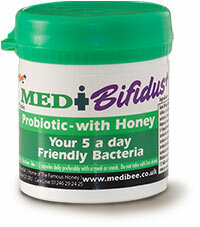 Medibifidus is our brand new Probiotic, which boasts 5 strains of friendly bacteria. Medibifidus contains 5 friendly bacteria, all of which can naturally be found in your gut - moreover, did you know that you have over 1kg of friendly bacteria living and enhancing your digestive state at any one time? There's over 60 million friendly bacteria in each capsule - Wow! Added natural honey is an excellent nutrient base for bacteria in your bowels. Did you know you should have 85% of friendly bacteria in your gut - have you? Probiotics in capsule form, suit so many people who cannot deal with the headache of milk drinks and yoghurts whilst on the go or just cannot reach the shops that day! Just the job "for those on the move"
Each 300mg capsule contains: Cellulose, Vegetarian Capsule Shell, Fructo Oligo Saccharides, Lactobacillus plantarum, Lactobacillus acidophillus, Lactobacillus delbrueckii ssp. bulgaricus Lactobacillus rhamnosus, Bifidobacterium bifdum. Price per pot: £ 5.50 + £ 3.50 P&P. Buy 2 or more and pay just £ 4.75 + £1.95 P&P.